New England Bloody Mary Bar. 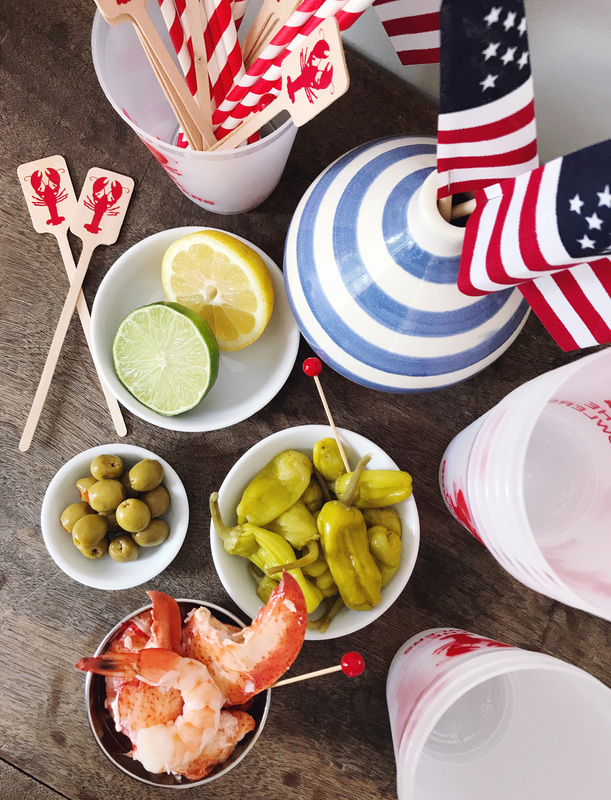 I think the best thing about the Fourth of July being mid-week this year is that we get to double the celebrations and BBQs and general summer festivities across two weekends. I had the best time last weekend hosting one of my girlfriends and her daughter at our house for a little mom and babies night-in while our husbands were away for a bachelor party. Since we were staying in after the kids went to bed, I decided to make homemade lobster rolls for dinner. Heading to our local fish market and grabbing a few fresh lobsters that were caught in the harbor across the street made for a tasty meal. 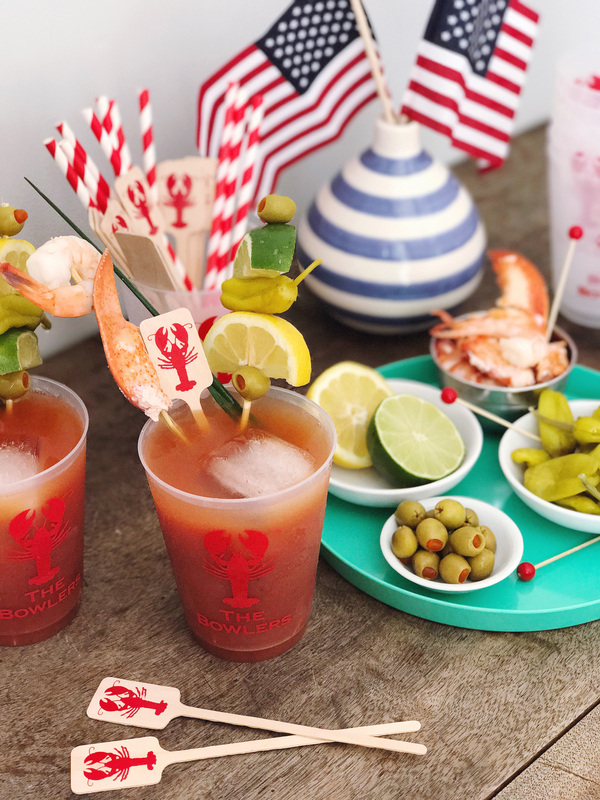 It also made me super appreciative how lucky we are to have this awesome seafood available to us and sparked an idea to use a few leftover piece of lobster (seriously, New England problems, leftover lobster) in a New-England style Bloody Mary cocktail. I feel like a Bloody Mary can be a polarizing drink, you either love them or you hate them, right? I’m a lover not a hater, and a big part of my love comes in the form of the Bloody Mary garnishes. You basically get an appetizer skewer with your cocktail – brilliant. My love also comes from a fond memory of my dad always ordering one Bloody Mary to kick off our summer vacations. That’s it, just usually one a year, as soon as the ferry docked. It’s a signal to unwind and enjoy life a little slower than usual, one sip at a time. 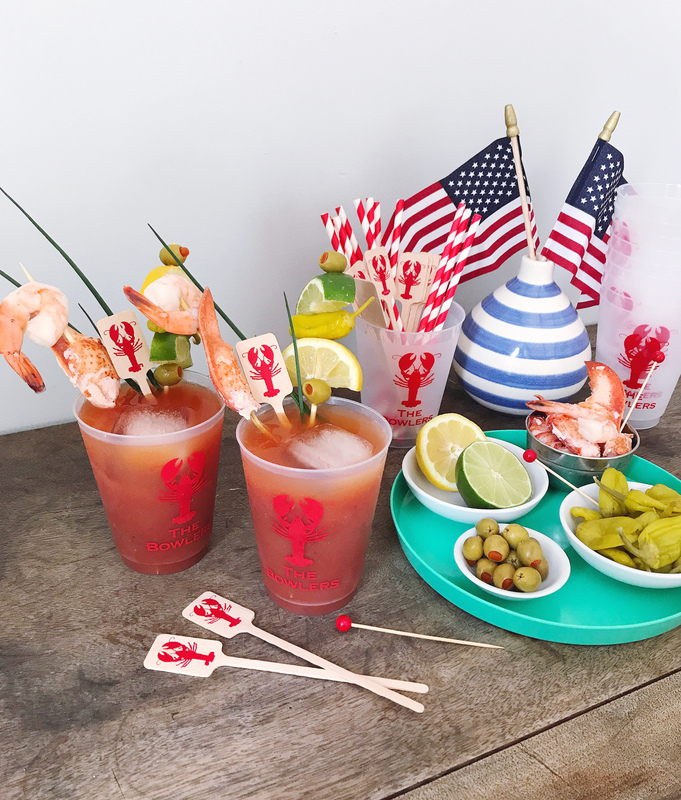 To make a classic Bloody Mary I cheat and use a store-bought mix (gasp!) but I’m all about efficiency these days. I do like to doctor it up a bit with a squeeze of fresh lemon juice, a little extra horseradish and Tabasco for spice and flavor, and a dash or Worcestershire sauce for more depth. My garnish always includes a lemon, a lime, salty green olives (add a dash of the olive brine to the Bloody Mary mix too!) and a pepperoncini pepper. 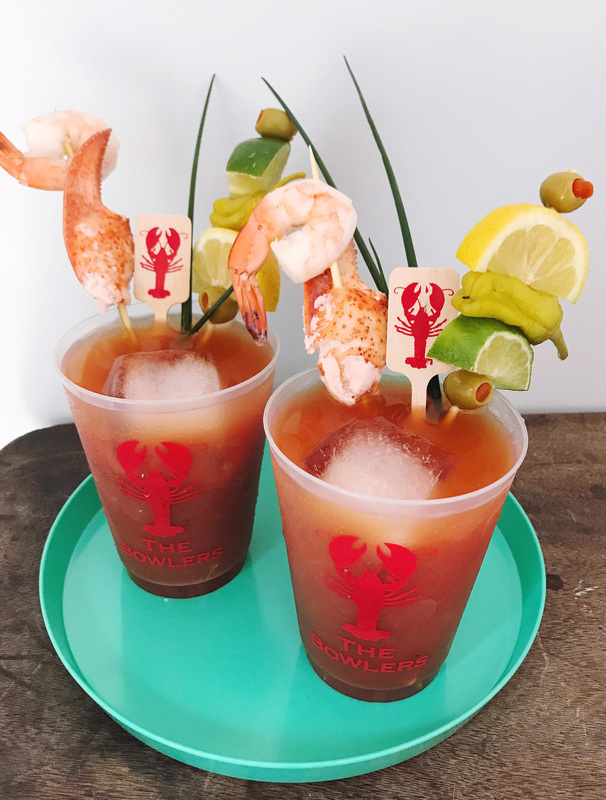 For these New England-style Bloody Mary drinks I added a second skewer with a bit of seafood: a lobster claw and cocktail shrimp, which pair perfectly with the citrus and acid in the drink. 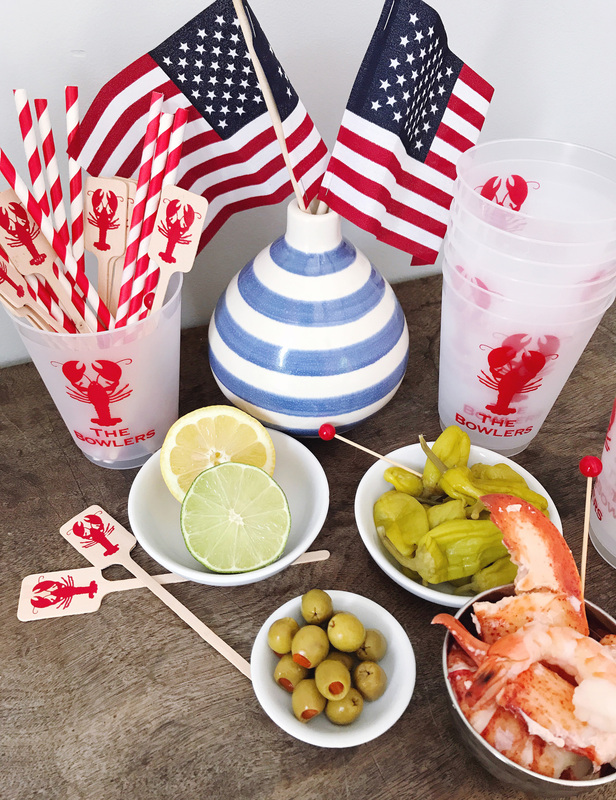 I served them in the most darling custom lobster cups that my friends at Two Funny Girls sent me! 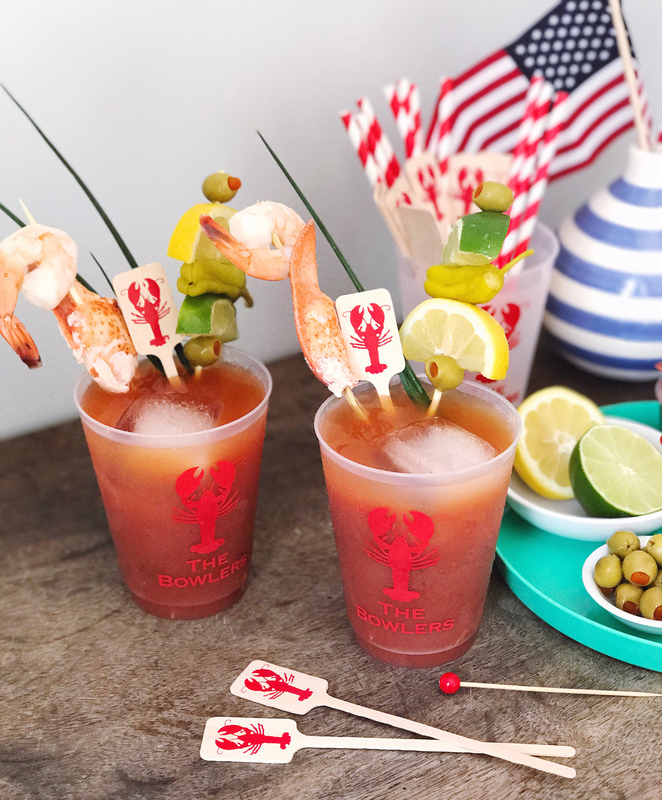 A few lobster cocktail stirrers for good measure were the perfect finishing touches – going to be keeping these guys on hand for my summer bucket list lobster bake we have planned for later this summer too!